This winter, while Winterthur is closed, we are trying something new. We are offering a class, taught by our beekeeper Chris Biondi that will finish in time for participants to start their own hives. The details are below and we hope that a host of members, staff, volunteers, and the general public will be interested! This introduction to beekeeping will teach you the basics of starting, maintaining, and caring for your honeybees. Winterthur beekeeper Chris Biondi and Charles Karat will present the history of beekeeping, provide information on where to purchase honeybees and equipment, discuss hive placement and site selection, describe basic honeybee biology including life cycle and diseases, and introduce Integrated Pest Management schemes. 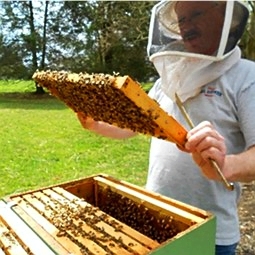 The class will culminate with a demonstration of how to install a “package” of honeybees at the Winterthur Apiary (proper beekeeping attire required–not provided). $85 members, $100 non-members. To register, please call Winterthur’s Information and Tours office at 302.888.4600 or toll free at 1.800.448.3883. Below is a flyer you can download and share – please help us fill this fun class!